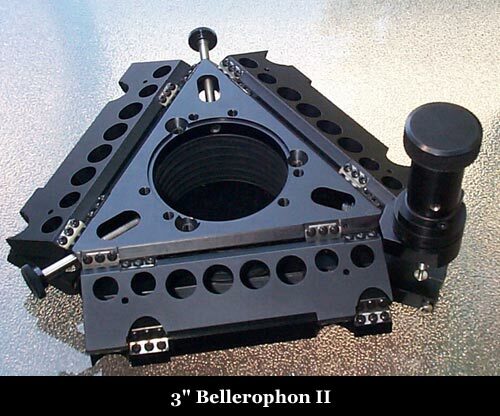 New Bellerophon II with 3" [76.2mm] of clear aperture, supports 15 pound [6.8 kg] load making it perfect for Large Format CCD Cameras and lots of accessories. It has 1.5 inches [38.1mm] of travel with an ultra-low profile of just 1 inch [25.4mm] allowing for less overhang and less vignetting. Ultra linear focusing is made possible by use of a single floating* micrometer leadscrew. When used with Robo-Focus and Auto Focus Software the path to focusing converges with perfect linearity. No more strange nonlinear behavior when converging on the focus point. 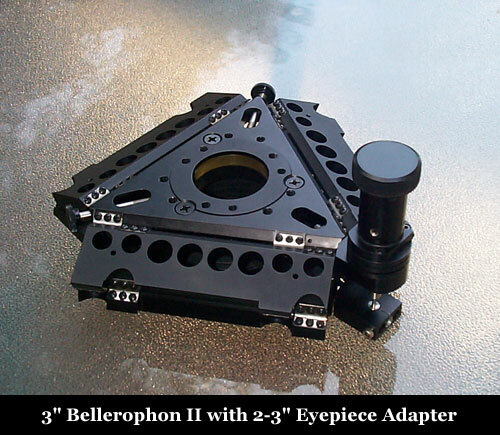 The Bellerophon II comes with a built-in adjustable slip clutch inside the focus knob. *floating - leadscrew is supported on both ends by all compliant supports. 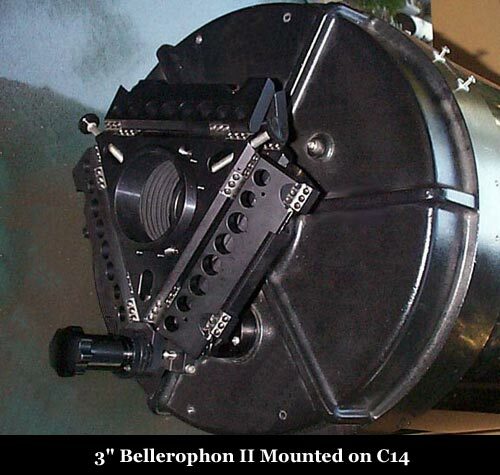 Above picture shows Bellerophon II with 2"-3" Adapter removed. The 3" opening accepts various adapter types and accessories can be bolted directly to the focuser top plate using the two sets of tapped holes [Three 1/4 - 20 and three M6-1]. Available mounting accessories include an Inline Adapter that replicates the large SCT threaded boss and STL11000 CCD Camera very low profile mounting adapter. Both adapters can be quickly inserted or removed by using two 1/4" knurled head bolts shown in the photo above. Custom adapters can be built to meet your special needs. The 2" eyepiece shown above is securely held with the 2"-3" adapter using two 1/4" knurled head bolts and an extra-wide [3/8"] brass compression ring. 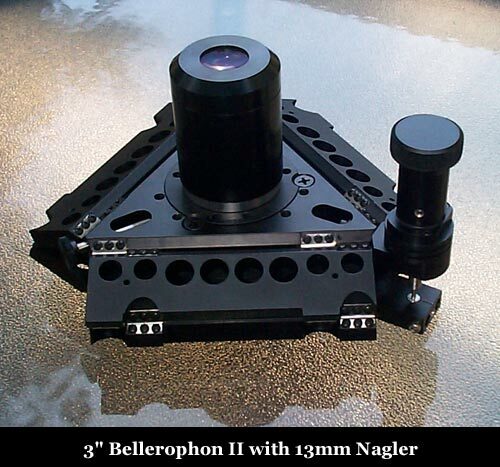 The photo above is the Bellerophon II mounted on a Celestron C14 using the new Split-Clamp Mounting Adapter. The Split-Clamp Mounting Adapter [shown in the photo below] threads onto the C14 large threaded boss and can be securely clamped on the threaded boss by tightening a single clamp bolt. 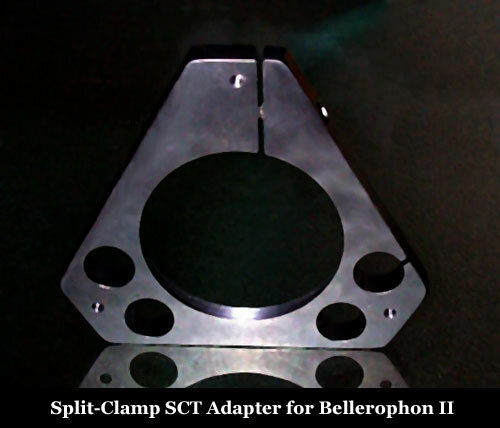 The split-clamp SCT mounting adapter adds only an insignificant 0.05" to the one-inch ultra-low profile of the Bellerophon II. Also shown is the Inline Adapter which replicates the C14's large threaded boss on the focuser top plate. The Inline Adapter thus allows you to utilize the accessories and adapters you already own, previously threaded directly to the back of the telescope, by now screwing them onto the top of the focuser. Split-Clamp Mounting Adapter works on all telescopes with large diameter SCT type threaded boss, including Celestron and Meade Telescopes. Other Mounting Adapters and Custom Adapters are available for various telescope types.